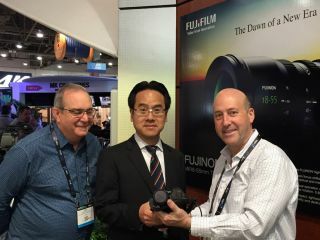 The Optical Devices Division of FUJIFILM announced the first sale and delivery of the company’s just-introduced “UA18x5.5B” 4K compatible, Ultra HD, handheld zoom. The Orlando-based live event and systems integration firm, LMG, purchased five UA18x’s for use within its expanding “Touring” and “Show Technology” divisions. The new zooms will complement Sony HDC-4300 4K/HD cameras and Panasonic AK-UC3000 4K Studio cameras and will be used to shoot large-scale music concerts and corporate events.